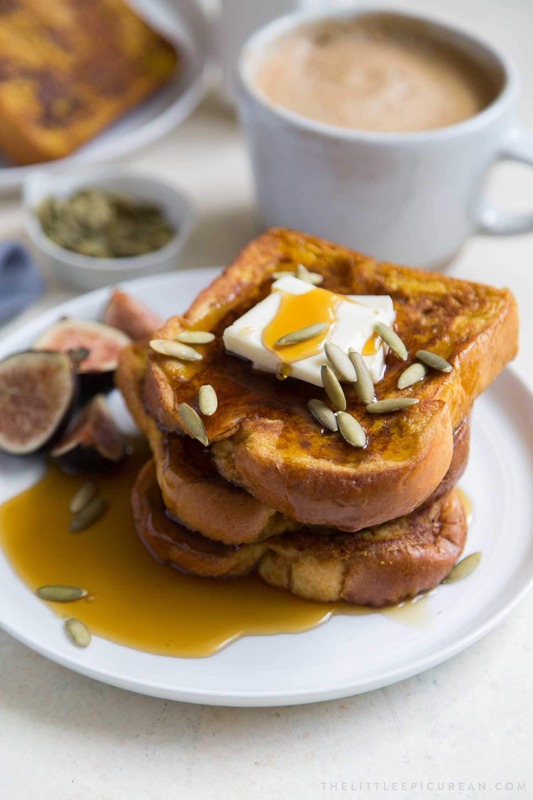 Thick slices of brioche bread are flavored with pumpkin puree and pumpkin pie spice mix to make this seasonal Pumpkin French Toast. French toast is known by numerous names: eggy bread, pain perdu (which translates to “lost bread” in French), German toast, gypsy toast, etc. Regardless of what you call it, French toast is essentially bread soaked in custard and cooked until golden brown. It is usually served with maple syrup and a side of fruit. It is best to keep the custard mixture in a wide, shallow bowl (think pasta dishes and pie plates) to accommodate the width of the bread. Lightly dip the bread into the custard mixture, ensuring both sides are coated. However, be careful not to over-soak the bread. Otherwise it might fall apart and be difficult to transfer to the skillet. 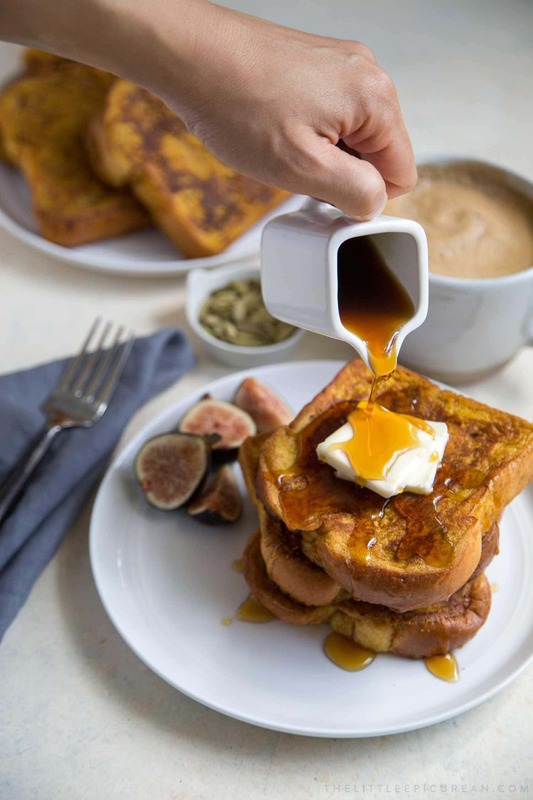 French toast is super simple to make at home. It’s the kind of breakfast you can easy whip up anytime because it uses kitchen staples you already have: sliced bread, milk, and eggs. 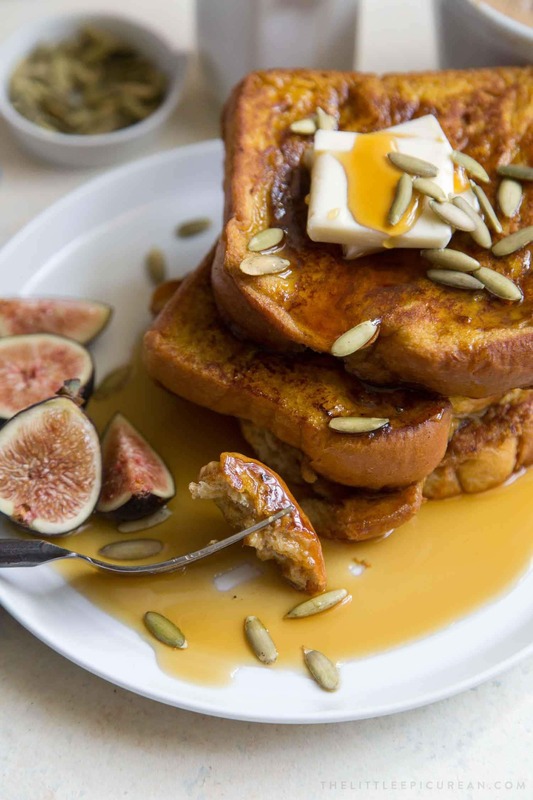 This autumn pumpkin French toast adds a little something special- PUMPKIN! The custard dipping mix has the addition of canned pumpkin puree and pumpkin pie spice mix (cinnamon, nutmeg, cloves, ginger). 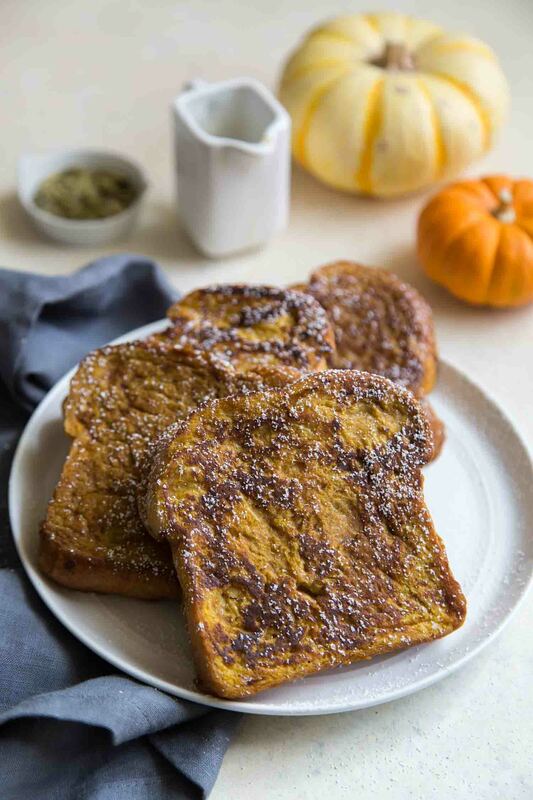 Go ahead and enjoy a stack of this pumpkin French toast with a pumpkin spice latte! Tis the season for all things pumpkin! Use an immersion blender to combine eggs, milk, cream, pumpkin puree, sugar, vanilla, pumpkin pie spice mix, cinnamon, and salt. Alternatively, use a whisk or fork to mix until smooth and thoroughly blended. Pour into a shallow bowl wide enough for bread slices. Set a large skillet over medium heat and melt about a tablespoon of butter (or heat oil). Working with one slice of bread at a time, dip bread into egg custard mixture. Turn to coat other side of bread. Allow any excess liquid to drain. Cook bread on hot skillet until browned on one side, about 2 minutes. Flip and brown the other side, another 90 seconds-2 minutes. Repeat with remaining bread. Add additional butter to grease skillet as needed. 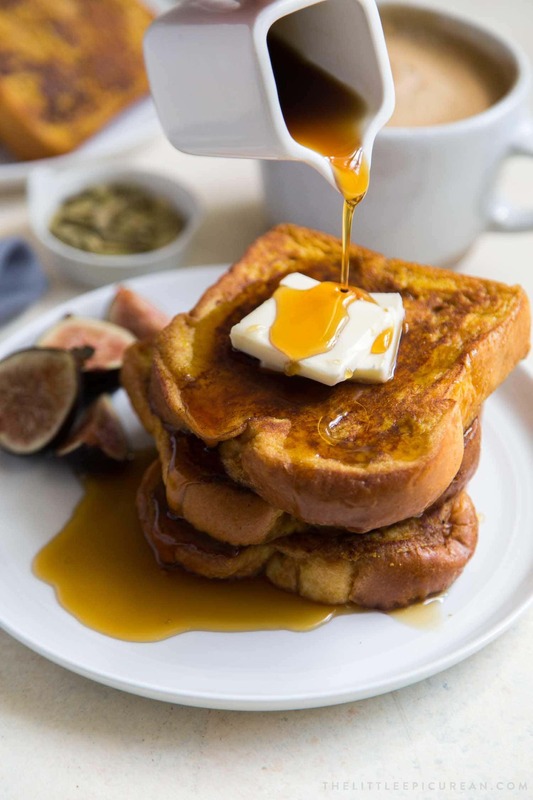 Serve pumpkin French toast warm with maple syrup. Use store-bought pumpkin pie spice mix or make your own by mixing together: 3/4 tsp ground cinnamon, 1/2 teaspoon grated nutmeg, 1/8 tsp ground cloves, 1/8 tsp ground ginger. Make sure to used canned PURE pumpkin puree, not pumpkin pie mix. I used Trader Joe's French Brioche. 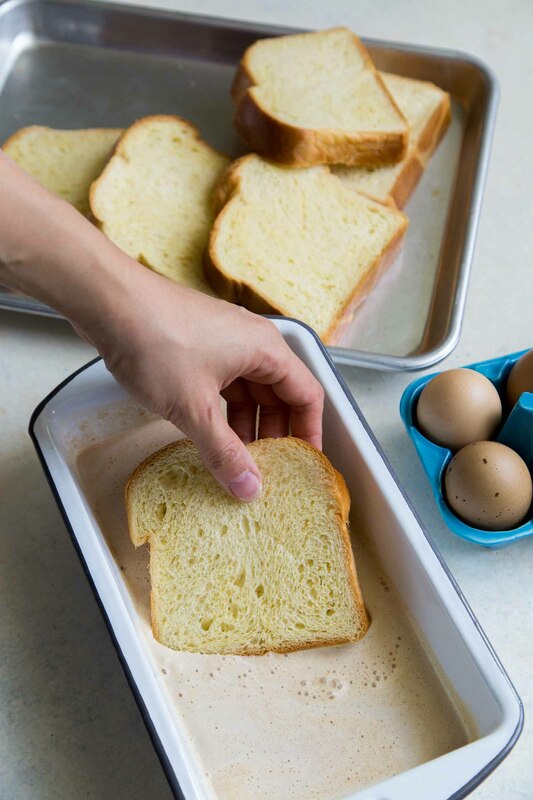 The bread is sliced thick and the bread is quite dense, making it perfect for French toast!